The KFT family is constantly changing and expanding. Last week we had a lot of excitement around our little office! We welcomed CoCo the Snapping Turtle for her first summer of many to come with the Kids For Turtles family. Mona Lisa, the Painted Turtle, is staying with the KFT family for a while to see if we can breed her with our resident Painted Turtle, Van Gogh. 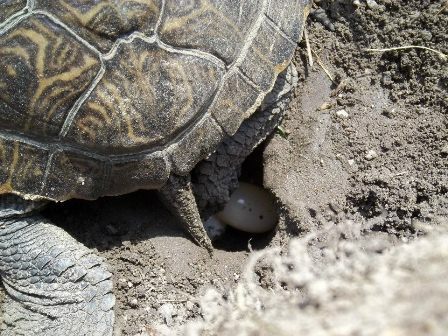 We also had two Red-Eared Sliders visiting us for a month from Scales Nature Park which brought us the biggest surprise of all – they both laid eggs outside on our lawn on the same day! Both of our ladies were desperately to escape their tank, so we took them outside for some sun and they immediately started trying to dig nests. It took all morning, and the help of 3 staff members, but Ariel and Pebbles successfully laid 14 eggs. We now have the eggs on display at the front of our office for everyone to see! We do not know if the eggs are fertilized, but we had an excellent educational opportunity fall into our laps. This is a great lesson for everyone out there; mature female turtles can lay eggs up to 3 times a year without being fertilized. Turtles are complex creatures. Our KFT membership is a vital support system which allows us to raise awareness about our native species and the importance of turtles in the ecosystem!